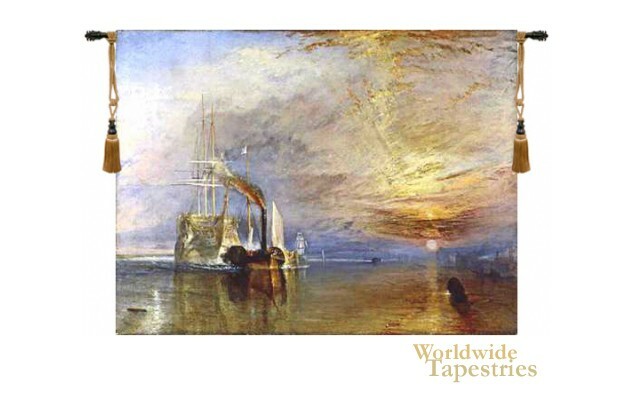 The Fighting Temeraire wall tapestry is based on the painting by J. M. W. Turner from 1838. This ship played a major role in the Battle of Trafalgar in 1805 and this 98 gun ship was meticulously painted by English artist Joseph Mallord William Turner. The ship sails on a backdrop of a sunset and the light and clouds are rendered most beautifully in this piece. It is a glorious portrayal of the sea and sun in its glorious interaction at dusk. The original now resides in the National Gallery in London. Fighting Temeraire tapestry is backed with a lining and a tunnel for easy hanging. Note: tapestry rods and tassels, where pictured, are not included in the price. Dimensions: W 51" x H 40"